Toys R Us/Babies R Us - 15% Off Printable Coupon! 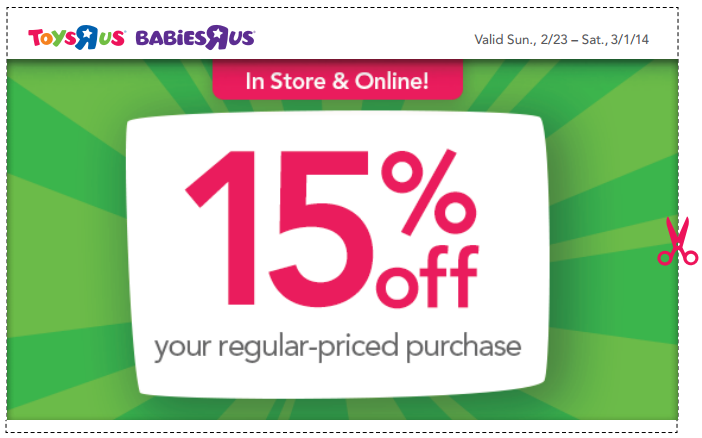 There is a HOT new Toys R Us/Babies R Us printable coupon valid for 15% off your purchase of regularly-priced merchandise through March 1st, 2014. If you prefer to shop online at ToysRUs.com use promo code SALE15. Exclusions apply. Keep up with the coupons, freebies and deals! Subscribe Now! Keurig Elite Brewer (K45 B40) for $97.30 with FREE Shipping! I just love my Keurig! Take a look at the deal on this Keurig® K45 B40 Elite Coffee Brewer for $119.99 (Retail $149.99). When you add to your cart, the price drops to $107.99 . Use promo code SAVINGU15 to take an additional 15% off which makes it just $97.30 with FREE shipping!! Includes a 12 K-cup coffee & tea variety pack and water filter. If you have Kohls Cash to redeem you can make this deal even better!! Unique design brews coffee in under one minute. Three cup sizes (6, 8 or 10 ounces) customizes intensity. Removable 48-ounce water reservoir makes filling easy. K-Cup Portion Pack allows you to enjoy a single serving. Removable drip tray ensures quick cleanup. Chrome accents add a modern touch to your countertop. The new Walgreens March coupon booklet starts today! You can combine these coupons with manufacturer's coupons for more savings! All coupons in this month's book are valid from 2/23/14 – 3/29/14. $1/2 Branch’s or Trolli jelly beans, 11-16 oz. or Brach’s chocolate covered marshmallow rabbits 8 pk. $1/2 Demet’s Turtles 6.4 oz. $1/4 Lindt chocolate bar 1.2-1.4 oz. $1/1 Neutrogena Sesame body oil or Rainbath shower gel. 8.5 oz. $1/1 St. Ives body lotions, 21 oz. $4/1 Bink tears 0.34 oz-1 oz. or Complete multi-purpose solution, single or 2 pk, 12 oz. ea., or Blink-n-clean drops, 0.5 oz, or Revitalens multi purpose solution 10 oz. $4/1 Children’s Claritin allergy relief 30 ct.
$1/1 Clear eyes eye drops 0.5 oz. $2/1 Lamisil AT antifungal cream 0.42 or 1 oz. or spray, 4.2 or 4.4 oz. $5/1 Pet Shoppe Glucosamine Joint support 120 ct.
$3/1 Tinactin antifungal cream 0.5 or 1 oz. liquid spray 5.3 oz. or powder spray 4.6 oz. $2/1 Tums ultra strength 1000, 160 ct. or Extra strength 750, 200 ct.
$2/1 Fujifilm Quicksnap waterproof camera, 27 exp. $1/1 Glade car scent 0.28 oz. 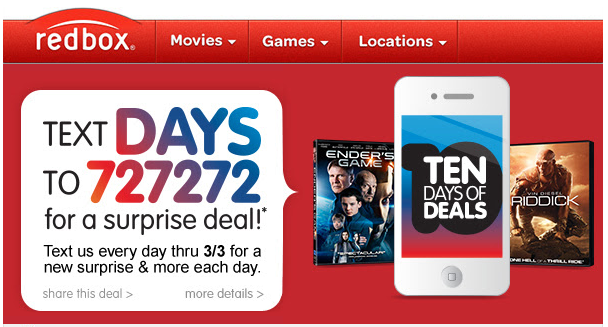 Redbox Ten Days of Deals are back every day through March 3rd! Just compose a message of the word "DAYS" and send to 727272 on your text capable device and receive a surprise promotional code in return. Standard messaging rates apply.